Maison nouvellement construite, aucune dépense épargnée. Belle piscine et salle à manger extérieure et cuisine / barbecue. La maison idéale pour se divertir et se détendre. Cuisine entièrement équipée pour cuisiner et manger, beaucoup d'espace pour se divertir. 7 chambres au total; chambre des maîtres est digne de la royauté, 5 plus belles chambres dans la maison principale. Immense piscine extérieure chauffée et grand bain à remous luxueux avec cour arrière. Vaste cuisine extérieure et salle à manger, entièrement équipée pour le chef le plus expert. Magnifique propriété pour se détendre, se divertir et se faire des souvenirs. (Piscine et bain à remous en hiver jusqu’à la mi-mai - ******* Frais de chauffage de la piscine / du spa supplémentaires, veuillez discuter de la réservation ****). A bunch of us stayed at the house for the Fourth of July weekend. Our only regret was that we were only there for 3 nights! The house was huge...everything as described per the listing and more. There was a whole basement (with living room, kitchen, and bathroom/shower) that we did not know about. The smell was a bit funky down there so leave the dehumidifier on when you get to the house. The pool was not well cleaned when we arrived but the owner sent the pool cleaner right away. Priscilla was very helpful and responded to all my questions via text. Once the pool was cleaned, it was amazing!! It was long enough for lap swimming and deep enough for doing cannon balls! The hot tub was nice too but it takes a long time to heat and you do need it heated especially at night. BBQ grill area wasn't very clean so I suggest you bring your own grate. There were tons of cooking supplies around the house and you can get water/ice from the fridge so the only things you need to bring are food and your clothes. You can shop for food at Stop & Shop nearby. All the rooms were spacious (especially the master bedroom) and the house was tastefully decorated. There was a basketball hoop at the front of the house (so bring a basketball) and the house had about 5 bicycles for you to use. 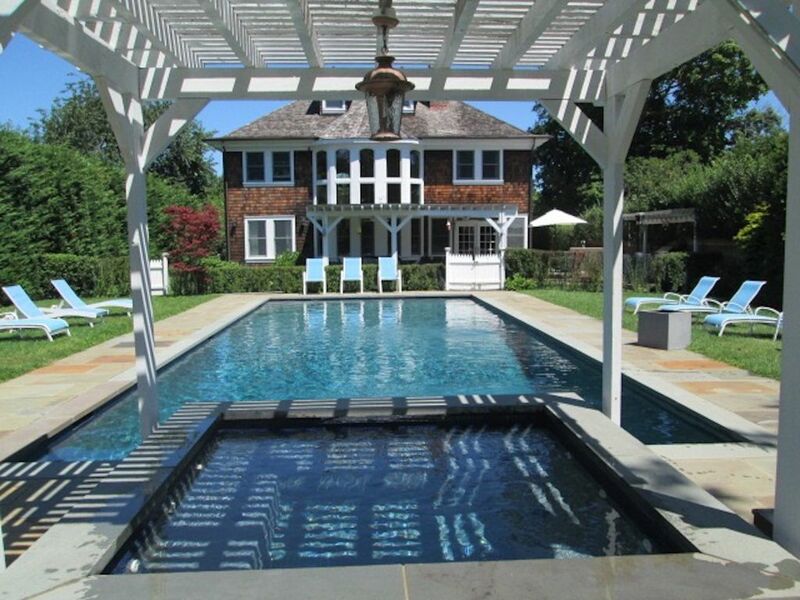 Overall, we had a great time and would recommend this house for anyone looking for a gateway in the Hamptons. My suggestion to the owner is to keep a "check list" of all the appliances around the house to keep track of items provided by the house. Also, the check-in instruction should include information on how to turn on the TV in the master bedroom and which light switch is for what to make things easier for the guests. Enjoyed a great weekend at this spacious, comfortable home. It had space to spare and lots of great seating areas, including outside which feels like an oasis! We were very sad to leave. The location is quite convenient, and the owners are responsive. It seemed well appointed for children, although we were a group of adults. It would have been helpful to have a sheet of info including check out procedures, wifi, hot tub, etc. Great property, just needs a bit of upkeep. The house and property are well-located, spacious, nicely appointed and very comfortable. The pool was not quite ready for our arrival, the smoke alarms would not stop beeping, not all the lights worked and other minor issues came up, but they did not keep us from enjoying our stay. It also would have been helpful to have a sheet of instructions regarding, for example, where certain house items were located, how to get on the house wi-fi, how to turn on the hot tub, and any pre-departure expectations. The house was reasonably priced and I would stay there again and recommend the property to others.